Blazer Bass ammunition is a staple of American range training. 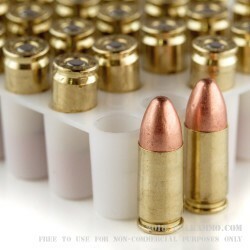 This affordable ammunition is known for reliable function in all stock 9mm pistols. There may be some match grade guns out there that don't like it, but if you have a Glock, Smith & Wesson, Kimber, Kahr, Sig, Ruger, or any number of other semi-auto handguns, then Blazer Brass is everything you need for a cheap day at the range. 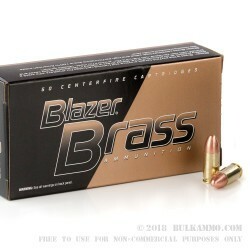 This 9mm Blazer Brass ammo is loaded with a 124 grain FMJ bullet that will closely match the military 9mm NATO ammunition. 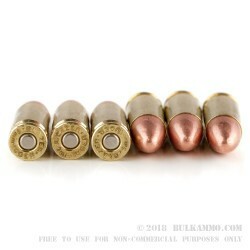 The 124 grain load for 9mm is a middle weight for the 9mm, having a balance of speed and weight, and is a great option for both compact and full size pistols. 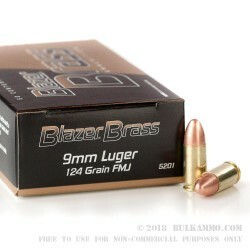 Blazer Brass loads their ammo using reloadable Boxer primed brass cases, giving an addition value to people who reload their brass after firing. Good ammo, available and fast delivery. My wife and I have put several hundred rounds through each of our Taurus 709 Slim and not had any issues. Bulk Ammo is the best on processing orders. Order today, it ships today. I live close to the shipping point in GA so even with ground delivery my order is at my front door the next day. Can't give it 5 stars on Bargain but its cheep enough considering the days of Walmart priced ammo are long gone.